At the end of the day… Looking it over… It’s was the sorta day that needed it’s own drum and cymbal lead in and outs so you could catch your breath before the next set struck it’s pose in the waiting wings. It was a long day, and an even longer 4 days prior. I will vaguely elude to a stress filled week and then leave you with that. Think big. Know we are good and handling it… But we wish we weren’t having to say hello to this again right now. It’s here though, and the best way to deflate the power of negative moments is to simply face them head on, and strong. So, my precious darling dear… This is for you… It’s your silly song to lock itself into your mind and chase off the monster callers who aren’t from the mind of Jim Henson. Keep your smile shining bright, even when it’s the last thing you want to do as you crawl into bed at night. It’s amazing strength can reach all the way into tomorrow and banish the creatures who may have lain in wait for you there… But will wait no more! they’re impatient, but God’s up all night making a safe pathway for you if only you ask him to. 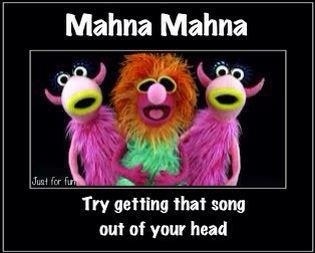 Now… I dare you to try and get THIS song outa your head today! Got stress? Send in the Manamanatt’s! I love “earworms”, songs that get stuck in your head because of their simplicity. I bought this single (the original version from the Italian movie) when I was a pre-teen. It’s been sung in our home from the beginning of TIME – as long as I can remember. Sometimes the only thing to get your mind off of stressful issues is to just have an earworm do it for you 🙂 Thanks for stoping by and getting bugged out! It works on 3rd shift too!